RENTON, Wash., Aug. 12, 2014 – Boeing (NYSE: BA) announced today it will donate $1 million to help expand Food Lifeline’s Kids Cafe meals program in Washington state in an increased effort to fight childhood hunger. 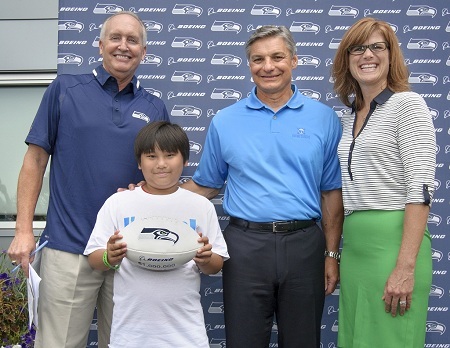 Pictured, from left, is Steve Raible, event emcee and voice of the Seattle Seahawks; Jonathan Tran, Boys & Girls Clubs of Bellevue, Wash. member; Ray Conner, president and CEO, Boeing Commercial Airplanes; Linda Nageotte, CEO Food Lifeline. RENTON, Wash., Aug. 12, 2014 – Boeing (NYSE: BA) announced today it will donate $1 million to help expand Food Lifeline’s Kids Cafe meals program in Washington state in an increased effort to fight childhood hunger. The donation from Boeing will be distributed over five years and will be used to help expand the meals program to additional sites in Western Washington. Over the period of the grant, the funding will allow Food Lifeline to scale the program from serving 200 children to serving more than 1,000 kids starting in 2016. Today’s announcement was made at the Seattle Seahawks training facility in Renton to put an added emphasis on the complementary goals of providing children with good nutrition in addition to living a fit and active lifestyle. Food Lifeline’s Kids Cafe program partners with Boys & Girls Clubs and other organizations to bring healthy food to after school and summer meal programs in high-need communities. Food Lifeline approaches hunger as a logistical problem that can be solved. Working with the food industry and its surpluses, we come up with creative solutions to stopping hunger, including redirecting good food from manufacturers, farmers, grocery stores and restaurants that might otherwise go to waste. We provide 82,000 meals a day to local food assistance programs, and that, combined with our policy work, creates a sustainable approach to hunger.